All day in the office we have been sharing stories of nice moments during the interviews, looking over the great photographs that we are borrowing from Bob Fuchigami, or laughing about our makeshift studios in our hotel rooms. I am looking forward to returning to Denver in July to meet more people and do more interviews. Below is a photo from Monday evening as we met to discuss the week’s interviews. 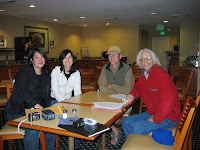 (Left to right) Dana Hoshide, Megan Asaka, Kirk Peterson, and Richard Potashin. And here is a photo from inside a great restaurant that Gil and Erin recommended during our last night in Denver. 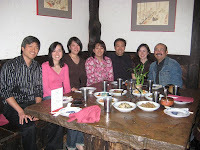 (Left to right) Daryl Maeda, Megan Asaka, Dana Hoshide, Erin Yoshimura, Tom Ikeda, Kara Miyagishima, and Gil Asakawa. Big thanks to Professor Daryl Maeda and National Park Service Historian Kara Miyagishima for helping us identify and select people to interview!